Well, it's with severe misgivings that I'm posting my project this month. This project was supposed to be our easy option, yet we have all struggled with this one. I have worked with canvas and gel before, and was not at all apprehensive as I started this project. However, I have not been able to produce the results that I wanted at all. This has been partly due to time constraints, and partly to the quality of my tissue paper I think. I knew straight away that I was going to make my own mask for this project. I love alliums, and wanted to make a mask to represent that flower on a Monet inspired background. 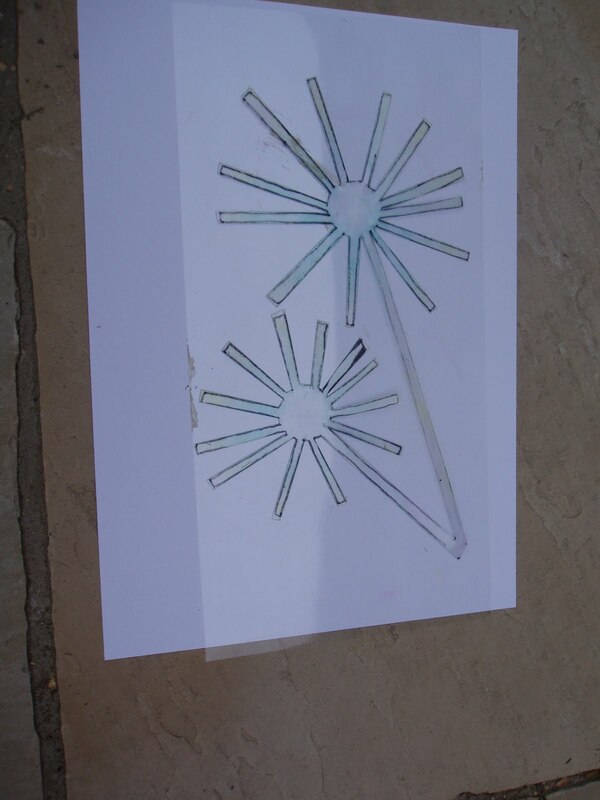 I thought about how I could achieve the effect that I wanted, and decided to make my mask in two parts, one for the stalk and one for an outline of the ball type heads. I created a background, using Adirondack paint dabbers, using Pebble in the centre, and a mixture of Willow, Juniper and Cool Peri around the edge, blending them softly. I then placed my two masks together in the centre, and inked around them using Citrus for the stalk and Wild Plum and Currant for the heads. I then took the head part away, and inked around the little branch pieces using first Citrus and then Stream for shading. 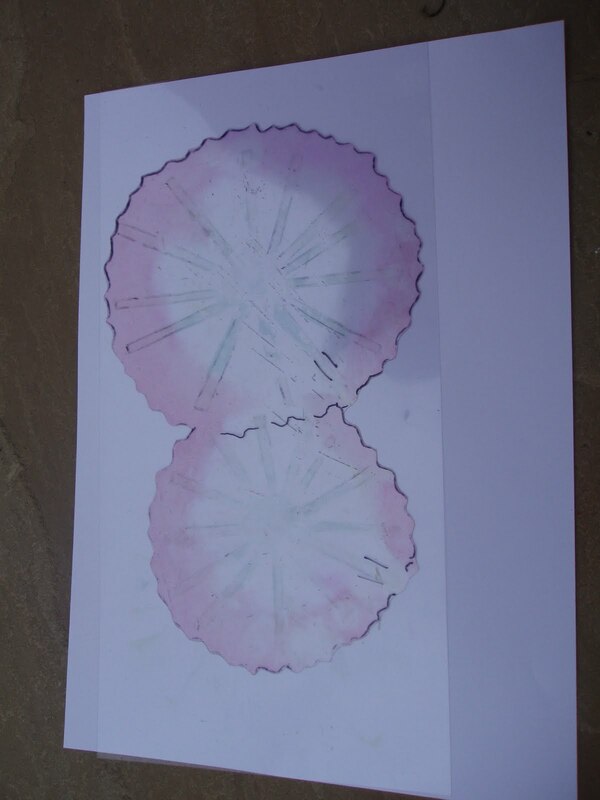 Next I used small dots of colour around the edge of the heads to represent the flowers of the Alliums. 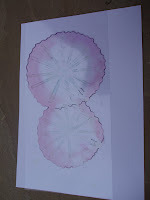 I used a mixture of Wild Plum, Citrus, Raspberry and White paint Dabbers. For my stamping, I have used a combination of stamps from Elusive Images, Stampotique, Artemio, and Tim Holtz, using Stazon to stamp them on tissue paper and acetate to create the effects that I wanted. Well done Judith! I think that's brilliant making your own mask and the little 'flower' dots seem to sparkle almost. The colours are beautiful too and I especially love those bees. Who would have thought this would be so difficult? I had no worries when I first chose this project having done a couple of canvases before using stamping on tissue. It doesn't pay to be complacent does it? I just can't get mine off the ground somehow so it will have to wait until after our jaunt next week when hopefully I can approach it with renewed confidence. Thankyou for making such a beautiful piece at what's turning out to be a bit of a stressful time. Judith, this piece has real impact. I love those greens together and the fab contrast with the pink. I find alliums inspiring too and this representation is absolutely unique. The technique has been trying for us but it hasn't spoiled your wonderful abstract art. I am so impressed that you made your own mask. This has lovely use of colour, I too love alliums - they are so elegant. 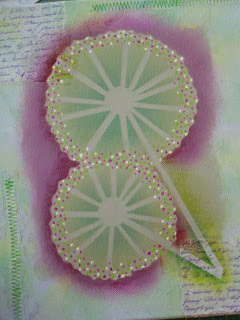 The idea of using the tiny dots to represent the flowers is inspired. 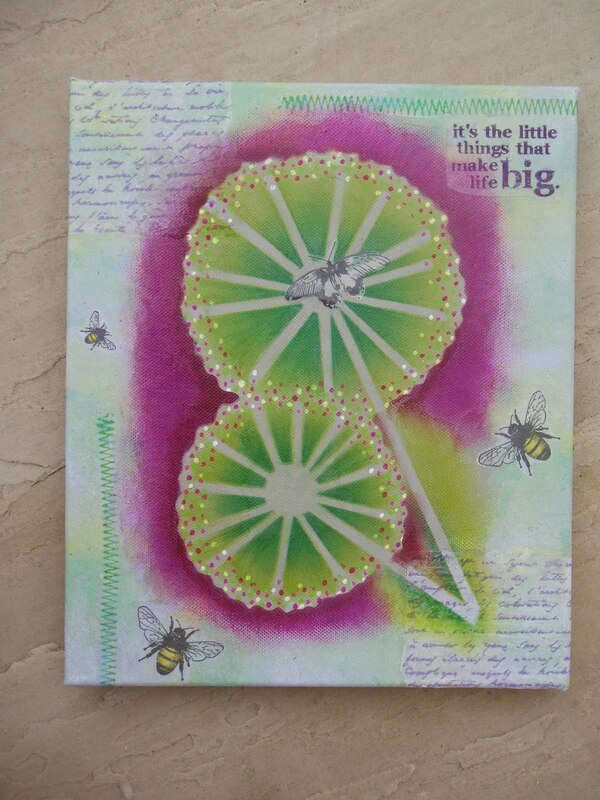 I so love those bee and butterfly stamps, they are gorgeous and work so well within your overall design. Well done to get this finished in the midst of an awfully busy week. Who knows when I will post. 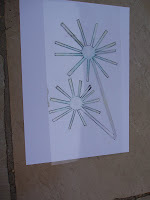 I am currently planning canvas mark 5!Thank heavens for gesso - at least they wont be wasted! I might get there by Christmas!! Looking forward to working with you IRL next week! I think this looks beautiful. The whole thing looks almost ethereal and delecate. Well done. You are all so talented.